Topher had a lot of firsts yesterday: first field tip, first time on a school bus, and first time to the Des Moines Science Center. Luckily, I was able to go and watch him experience all of them. 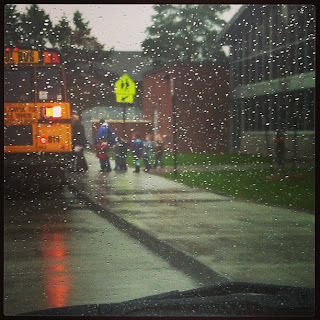 The day started with me following a big yellow school bus downtown in the rain. It was a fun, chaotic day. Happy first field trip to my favorite little man! I can't believe I never blogged about going to Chicago in mid-February. Especially since Topher has been talking about it ever since. Road trip to the city! Despite growing up surrounded by corn and soybean farms, or perhaps because of it, our child loves the city. I mean, he LOVES the city. If there are tall building around, he thinks we have somehow been transported to a higher sphere. When there are crowds of people, bustling traffic, and no clear view of the horizon, our little boy has met his heaven. I don't personally know if February is the best time of year to visit Chicago (I hear it is not) but we have dear friends there who we have not seen for a very long time and we needed to meet their adorable little boy (who was, I'm sorry to admit, approaching his first birthday). Our friends were kind enough to watch Topher on Saturday morning so TJ and I could visit the Chicago temple. Later that day, we all braved a trip into the city together. It was too cold to be outside for anything more than a dash from car to building, so we decided on the children's museum. One of TJ's other friends lives right in the city and brought his little boy to meet us there, too. What a great impromptu reunion. Look at all the buildings, mommy! Is this New York City, mommy? Can we ride the Ferris wheel? Please?? What a great weekend. We promised we would go back when it gets warm because Topher so desperately wants to ride the train, metro, buses, and anything else the city has to offer. He wants to ride an elevator to the top of one of the buildings. He longs to hover precariously at the crest of the huge Ferris wheel. Mat, Angie, and Rowan, thank you for being such kind and funny hosts. We always have so much fun with you. You are wonderful friends, so it's no surprise to watch you being natural and wonderful parents as well. Chicago, with any luck we will see you again soon. For a long time now, as we have walked around our neighborhood, I keep noticing that most other houses have a welcoming, comfy chair sitting by the front door. I like the nuance of it. The come-sit-and-enjoy-life-from-this-porch attitude. The suggestion that we must be kind people because we keep a lovely chair on the front stoop. I want to be one of those houses. And our front porch has just enough room in the corner there for such a chair. The problem is finding the right chair. I perused Craigslist. I roamed the garden aisles at Target and Walmart. I visited the local furniture consignment shop. There are plenty of cute chairs, they just cost WAY too much for my little wallet. Last week I mentioned my chair idea to my mother-in-law and she said she HAD a chair like that, just sitting in the basement that I could have. I know fate when I run into it head-on, so I gratefully brought home a new wicker chair. I could barely wait to get to the store and pick out some paint for it. First, I found a seat cushion at Walmart for $12. I figured that was cheaper than buying the fabric and foam and making my own. So I went for it. Then I took that cushion over to the spray paint and selected an "Oxford Blue" color because it looked right next to the cushion (plus it sounded well-educated). I set the chair in the grass and started spray-painting it. 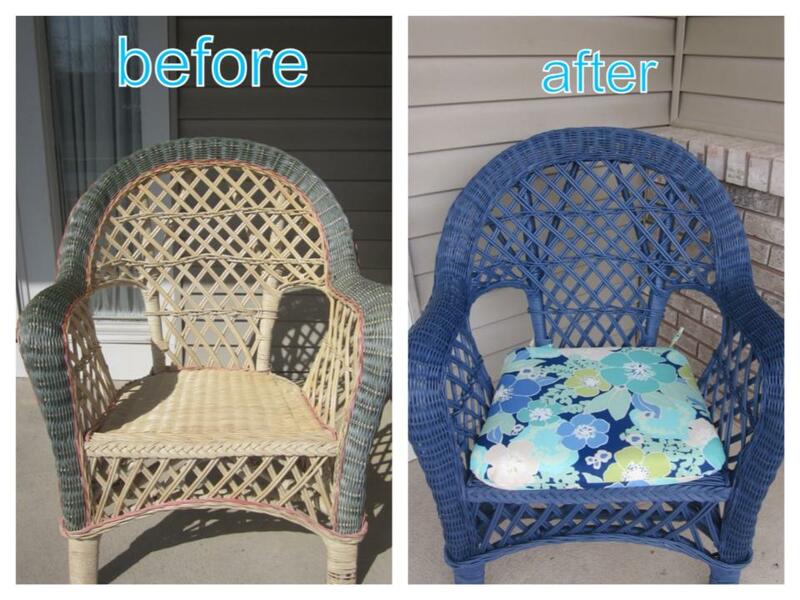 I did not prime this piece because the blue I was using was significantly darker than the wicker color. I used 2 full cans and decided that it looked great. Then I put it up on the porch and suddenly, staring at it from a lower angle, I could see all the many, many places I had missed. Two MORE full cans of Oxford Blue later, it really was done. My advice: if you are painting wicker, turn it every which way and spray it from every angle (upside down, sideways, top-ways, bottom-ways, etc.) because there are so many nooks and crannies to cover. But for what minimal effort it took, I have to say the outcome was rather satisfying. It looks great on the front porch and not half-bad in my living room, too! I hope people will walk by my house and say, "What a comfy little porch they have, I really want to get to know that family." Or something to that effect. We booked the church for Friday, April 5 and started handing out flyers to friends, neighbors, and everyone at church. The girls amazed me the whole way through. They were confident in promoting the event, they took charge of making posters and helped decorate, they each committed to bringing a crockpot of soup and a baked good to auction off, and they were there all there early, ready and willing to make the night a success. I'm afraid I was dragging a bit more than they were.This last Sunday, I still hadn't started on decorations, although I was circling some ideas. I finally chose a "Spring" theme and started making different cutouts each day throughout the week. My amazing husband took a half-day off on Friday, my amazing in-laws took Topher for the day (and overnight!) and we started decorating the cultural hall at church. And the best part of the evening: the turnout. I had NO idea so many people would come to our fundraiser. I was so grateful for every single person that walked in the door. Even though we had set up every table the church had, it wasn't enough seats, so we got out some skinnier tables and doubled them up until everyone had somewhere to sit. My cup runneth over. It was a smashing success. The girls brought music and it made the night feel like a party. My brother-in-law and my friend made brilliantly funny auctioneers. We made enough money to completely cover the cost of camp for every single girl who participated, plus we recuperated the funds spend on hosting the event. I am so, so proud of the young women. They were complete rock-stars last night. They were alert, engaged, and ran the whole show. And it feels good to be able to tell them that all their hard work paid off. Pack your sleeping bags, girls! Camp starts in 9 short weeks and we're going to rock that too!